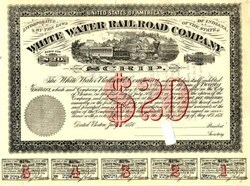 Beautifully engraved unissued certificate from the White Water Railroad Company dated 1878. This historic document was printed by Henry Seibert & Brothers, Lithographers, and has an ornate border around it with a vignette of a train passing by in a rural setting. This item is over 126 years old. This company was incorporated under the general laws of the State of Indiana, May 27, 1878, by the purchasers of the White Water Valley Railroad (original incorporation, June 8, 1865). The Cleveland Cincinnati Chicago and Railway Company owns the entire capital stock of the White Water Railroad Company, and operttes it as part of its road. Leased to The Cleveland Cincinnati Chicago and St Louis Railway Com any September 11, 1890, lease effective July 1, P 1890, running fifty years.